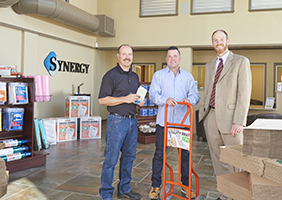 Chris Ross (center) and Joel Sikkila (left), owners of Synergy Self Storage with James Gallagher, Senior Vice President, Commercial Loan Officer, Merrimack County Savings Bank. Writing an effective business plan? Here are some guidelines for success. All reputable lenders, including Merrimack County Savings Bank, want to help you ensure the success of your business. One of the best ways to communicate your goals and plans is to share your business plan with us. While the executive summary appears first in your business plan, it is often helpful to write this section last, after you have worked out all of the details.